It may be 65 degrees with a record high and sunny skies in Philadelphia this Wednesday afternoon, but in just a few hours the temperatures will drop to the 30's and the skies will be filled with snow. The precipitation will start off as plain rain later on this evening around 10 pm. Overnight, expect the changeover to snow to happen from NW to SE and the mercury drops. By the early morning hours, all areas should be seeing heavy/wet snowfall accumulating 1-2" per hour. Snow will continue through about midday and start to taper off after noon. 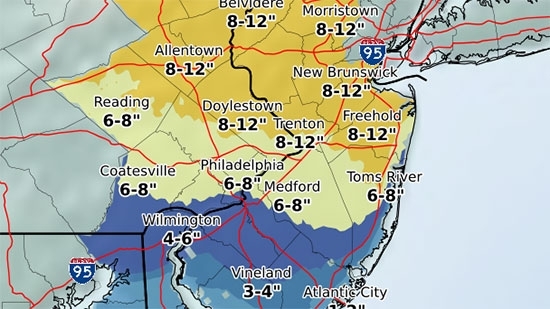 A general 6-8 inches of snow is expected around the area with possible local higher amounts and with less down the shore. Cold air will filter in behind the storm as it clears out Thursday afternoon with highs on Thursday around 30, and going into the 20's Thursday night. Expect a difficult morning commute no matter what.